One of the things I’ve been working on, behind the scenes, includes grant writing. I’ve been involved with four grants in the past two weeks. Which reminded me, today, of the brilliant work of the artist David Shrigley, who aims to articulate complicated links between things in his cartoons. This is a good map of how my brain feels just now. That's brilliant. I intend to display it at every Network Analysis workshp I ever go to ;-D Do you have a reference for it? 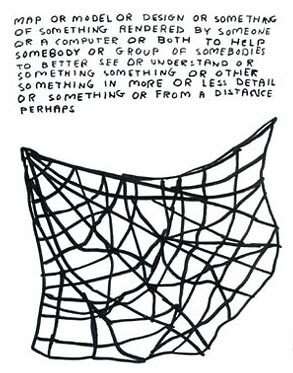 its by David Shrigley. just google him. you should check out his books of drawings, they are ace, and v funny. I just stole this one of the interweb, uncited, I'm afraid!